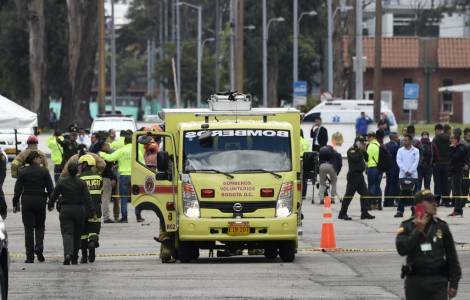 AMERICA/COLOMBIA - The Bishops: "total rejection of any form of terrorism and violence"
Bogotà (Agenzia Fides) - The Episcopal Conference of Colombia (CEC) strongly rejects the recent terrorist act that occurred at the "General Santander" National Police School in Bogotá, which caused 21 deaths and at least 68 people were injured, according to the latest updates. "Total rejection of all forms of terrorism and violence. We cry and continue to seek peace through dialogue, reconciliation and social justice. Solidarity with the national police and the families of the victims": these are the sentiments expressed by the Archbishop of Villavicencio, Oscar Urbina Ortega, President of CEC, in a note sent to Agenzia Fides. According to information released by the Colombian authorities and local media, yesterday morning a man, José Aldemar Rojas Rodriguez, showed up at the entrance of the Police School, where a ceremony was being held for the decoration of officers and cadets, who was driving a van full of explosives. A dog detected explosive substances, and the agents asked the driver to get out of the van, but instead accelerated, and the van crashed, which exploded against a building.